As of January 1989 all ten sites in the original Dornier MPL 9000 study became operational. The purpose of the study is to evaluate both the effectiveness of biliary lithotripsy and the need for the adjuvant chemolytic agent, ursodeoxycholic (UDC) acid. As of December 1988 at Crawford Long Hospital 186 potential patients were screened, and 140 patients were treated using the Dornier MPL 9000. The experience at Crawford Long was similar to that published by the Munich group in that the ratio of females to males is 2 to 1 with patients ranging in age from 20 to 99 years. The majority of patients were classed as Anesthesia Risk Assignment (ARA) I or II. The majority of patients had solitary gallstones smaller than 20 mm, and the next largest category included patients with two stones. Ten patients had stones which were partially calcified (3 mm nidus or 3 mm rim). The average time for the procedure currently is one hour and fifteen minutes. 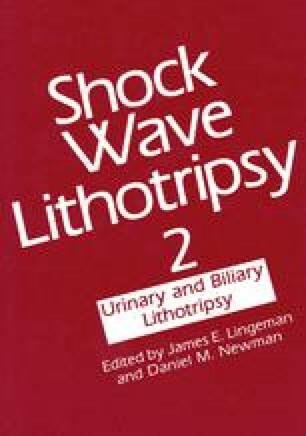 Each patient received 1,500 shock waves, regardless of the appearance of the gallstone fragments during the procedure. All patients were given intravenous sedation/analgesia. The majority of the procedures were performed in the prone position; more recently, patients also have been treated in the supine position. A stone center is currently being established at Crawford Long Hospital. This stone center brings together a multispecialty group of physicians, each of whom has special talents. The center will provide patients with consultations and treatment options for gallstones, biliary disease, and, eventually, urolithiasis. In the case of gallstones, treatment options include surgery, biliary lithotripsy, chemolytic therapy (UDC acid), percutaneous stone fragmentation using laser and/or mechanical disruption, and the use of dissolution agents such as methyl tert-butyl ether (MTBE).